Neodymium magnets are the strongest, the most important and commonly used permanent magnets at present. Based on different manufacturing process, it is divided into sintered NdFeB magnets and bonded neodymium magnets. China Rare Earth Magnet Limited produce and supply both sintered and bonded NdFeB magnets in a variety of grades, sizes and shapes. Welcome to watch our YouTube video. We also supply some relevant products like magnetic pole detectors which can distinguish N, S poles of magnets, and digital gauss meter which can measure surface fields (Gauss value) of permanent magnet. 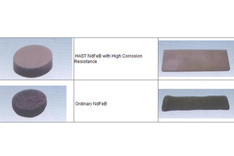 Sintered NdFeB magnets are stronger than bonded NdFeB magnets. The grade of sintered NdFeB magnets is named as N35~N52, N30M~N50M, N30H~N48H, N30SH~N45SH, N28UH~N40UH, N28EH~N38EH and N28AH~N35AH(Download Magnetic Property Sheet of sintered NdFeB).Under the temperature of 80°C,N52 magnets are the strongest permanent magnet material. Customers or users can order the most suitable NdFeB magnets from us according to their actual needs and application. China Rare Earth Magnet Limited manufactures bonded neodymium magnets through process of "compression molding" or "injection molding". 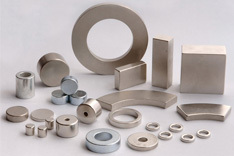 There are various grades of bonded NdFeB magnets in view of different magnetic characteristics and physical properties. The grades of compression molded bonded NdFeB magnets are named as BNP-6 ~BNP-12(Download Magnetic Property Sheet of Bonded NdFeB). And the grades of injection molded bonded NdFeB magnets are named from BNI-3 to BNI-7. 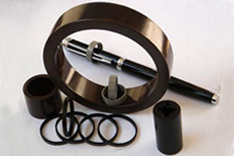 The most common used coating on bonded NdFeB magnets are black epoxy. NiCuNi, Zn, Black Epoxy, Sn, Au, etc.